Tel: 01451 830461 or Mob: 07768 954304. All written communication to Mrs L. Parkes, 47 King Georges Field, Stow on the Wold, GL54 1AS. The Society would like to wish our all our flock keeping members a very successful lambing season! 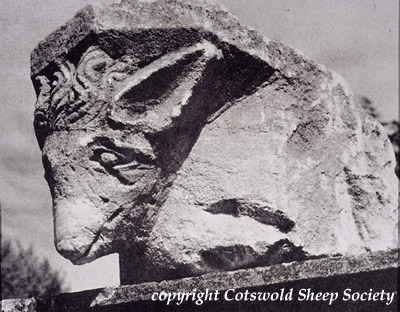 The Cotswold sheep, often referred to as the 'Cotswold Lion' was introduced to the UK by the Romans. Their wool known as the 'Golden Fleece' was an important export. It not only played a major role in the development of many Cotswold towns and villages, but also in the finances of the nation. Sadly times have changed, and they are now classified as a rare breed. 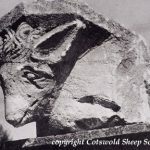 Click Here for more information about the history of the Cotswold Sheep. Davina Stanhope with her Shearling Ram, Tingewick Florin, Show Champion at Cirencester Market 2017. Spinners hard at work at the Woolly Event, Meysey Hampton.